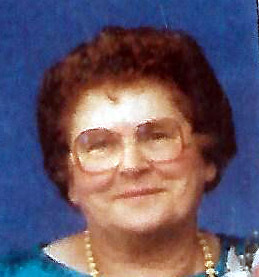 Nettie (Anastasia) Schurko was born in the Beaverdale district on August 5, 1918 to Mike and Anne (Krunick) Schurko. Nettie was the last sibling after eleven brothers and sisters. On November 18, 1946, Nettie was united in marriage to Michael Hull. Together they made their home on the family farm in Beaverdale district and raised their two children. Nettie enjoyed the mixed farming life. She loved to be outside and her favourite pastimes included tending to their farm animals, maintaining the farm yard and her flowers. Nettie spent many hours growing vegetables which she gladly shared. Her leisure time during the winter season was reading and crocheting. On November 1, 1997 – Nettie moved to an apartment at Yorkton Independent Manor. Later, failing health necessitated a move to the Yorkton and District Nursing Home in December 2006. Nettie was predeceased by her husband Michael on April 5, 1992. She leaves to mourn her passing and cherish her memory her children, Dianne Tymko and Richard Hull, grandchildren Chad and Christopher Tymco, Cara, Jacy and Brethen Hull and many nieces and nephews. The family would like to thank the staff at the nursing home for their compassionate care. A funeral service will be held for Nettie on Monday, August 20, 2018 at 10:00 am from the chapel of Christie's Funeral Home with the Rev. Fr. Bohdan Lukie, CSsR officiating.